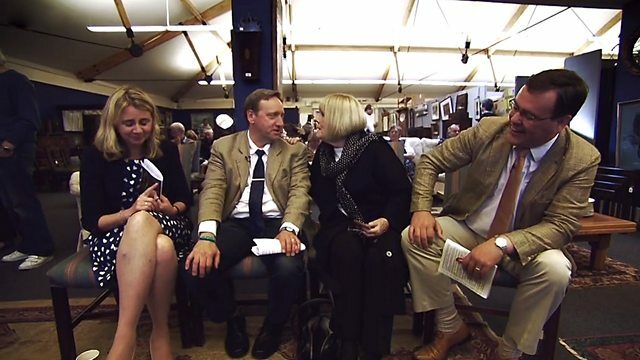 This edition of the celebrity antiques challenge sees Midsomer Murders star Neil Dudgeon take on Dame Diana Rigg with experts Catherine Southorn and Paul Laidlaw. Browse content similar to Dame Diana Rigg and Neil Dudgeon. Check below for episodes and series from the same categories and more! There will be worthy winners and valiant and losers. Today's Celebrity Road Trip brings together two acting titans. -That's a nice gear change, wasn't it? I'll stop now before it all goes horribly wrong. We're in the presence of a Dame. Legendary actress Dame Diana Rigg is back in the country of her birth. Oh, not so good. There we are. That's it. You're giving the car stomach ache every time that happens. in the 1960s television series The Avengers. she's used to playing strong leading roles. She's also no stranger to antiques. I imagine you have a lovely few antiques of your own, Diana. and it's a wonderful way of, you know, spending your afternoon off. Neil is behind the wheel of a 1964 Rover 110. Inspector Barnaby in Midsomer Murders. to procure some purchases and negotiate some deals? How are you at bargaining? offer at a price, thinking, "We'll say, I don't know, 200 quid,"
and then you say, "20 quid,"
everybody snorts and leaves the room, they come back and go, "100 quid,"
-"for if I'd suggested another price." It's always worth trying it on, isn't it? ..Neil was chauffeur to Diana's lady detective. to protect her from splashes, foot pads and marauders? -did you manage to pick pocket that key from Miss Bunting? Although chauffeuring Dame Diana is not coming as easily to Neil today. -It's like Chitty Chitty Bang Bang. Our celebs aren't alone in their quest. and auctioneers Paul Laidlaw and Catherine Southon. And anticipation is mounting in the 1992 Alfa Romeo Spider. Diana Rigg. Now, she is sensational. I mean, she's just an icon. -Beautiful. Avengers, leaping over the car. -I'm not expecting a catsuit, though. -That would be wrong, wouldn't it? I'd say a step too far, yes. He's good things like murders and, you know, investigating. I think he'll be great at hunting down the antiques. ending up at an auction in Stansted, Essex. a country house just outside the town of Doncaster. Do either of you come with the experience of our world, antiques? First of all, you've got to base it on instinct, haven't you? -Guts take you a long way. Isn't that nice to hear? -I'm not sure. My strongest instinct is never to trust my instinct. -So, you can't be spontaneous. So, two contrasting approaches from our celebrities. not trusting himself at all. If you're going to be in that, you need a beret. That would be lovely. My hair has been going haywire. -I do love a bit of sparkle. -I don't want to look like Frank Spencer. so this is a bit of a local derby. -I'm sure I will. But you're not going to be shy, are you? Follow your instinct, your taste, we're in there. Dame Diana, shy? Somehow I don't think so. -So, here we go, Diana. -It's a huge, by the looks of things. Right, then, your destiny awaits. array of stock will surely satisfy Diana's thirst for antiques. -Are you the queen of all we survey? A dame and a queen, eh? You're a lucky boy, Paul. -OK, can we have a quick look around? -And holler when we find something, yeah? -There's plenty to go at for you. With so much to choose from, where to start? Stand-by - Diana's gone straight for the kill. -Oh, look, can I see the lady playing on the violin? Slightly scary, really, don't you think? It's the stuff that nightmares are made of. Schuco, mid-20th century? Is that reasonable? You're so clever. I would never have known that. Have you got a price tag on that? -What sort of price are you...? Steady, steady. Can we do this in a double act? Let me introduce ourselves. We are hard-bitten, hard-faced trade buyers. -He's the hard sell, I'm the soft sell. OK, I'm happy to be the bad cop. -Can you be as gentle on us as possible? -Oh, my word. Now you're bad cop. I am really grateful because I think he's absolutely charming. A bold start for our dame. The first item of the trip for £25. Looks like Paul's going to have his hands full here. Meanwhile, Neil and Catherine are getting acquainted. -Tell me about you, Neil. Antiques. -I know virtually nothing about antiques. -Well, that's a great start. It's going to be a huge, great voyage of discovery for me. -Well, we're on a mission. -We've got to find some good, good, eye-catching objects. And, if all else fails, we'll sell the hat. I don't think Diana's going to be very pleased about that. I'm not sure she would either, Neil. I'm going to leave Diana's hat here. I hope it doesn't get stolen. It had better not. Upsetting a dame is never a good idea. How lovely to see you. Are you having a nice day? Can I get you a tea or anything? Am I overdoing it? I don't know whether you've got anything... Oh, look! He's very quick to catch on. -How long have we got? Let's buy that clock and go to the pub, come on. Mmm, perhaps I spoke too soon. -And then you say, "That's horrible." Might this little elephant be to Neil's taste? -I know but that's not bad. It's a Vesta case, a small, portable box used to keep matches dry. they were very popular in the late 19th and early 20th centuries. The people were much smaller. And they only smoked little cigarettes. -Exactly! But that's quite unusual, isn't it? I want you to be honest about this. Originally, would this have had eyes and tusks? I'm sure it would have, yes. and we would have had little ivory tusks. But it's unusual. It's quite nicely modelled, though, isn't it? I think they're considering it. I don't want to rush into anything. Self-doubt creeping in there, Neil. Go on, trust your instincts for once. We would be interested. Our problem is that there's tusks missing. The glass eyes are missing. Can we find out what's the very, very best price? -That would be lovely. Yeah? -Yeah, well, if you can talk about prices. -He's just so blase about the whole thing. No, I... Well, you're used to this, you see. I don't get out much. back in Rotherham, Diana's full steam ahead. I suspect this isn't going to be a problem, do you? First stall we went to, first cabinet - "Oh, I love that." Decisive. She lived up to her promise. "when I see it. I will run with my instinct." She's got some instinct thus far! And she delivers. Now, what's she on to here? Still on a jewellery mission. -You're not to keen on this but you're a fella. a collection of costume jewellery. Because you're probably a greedy man. Are you a greedy man? I think the girth tells us a lot about that. No, we wouldn't do that. I'm going to shake your hand this time. You're something else, are you not? continue to deliberate over the elephant Vesta case. They're really thinking this one through. I think that would be tops. 39 - 40! Oh, I could have got 39! All right, go on, we'll have that. But they're not done here yet. It's a pig. But it looks to me like the pig is wearing a bowler hat. -coming out of there but what is that? I don't think it's a pipe or anything. Looks like it's got an umbrella in the other hand. Oh, he's a city gent. He's a pig with his nose in the trough. -How much do you want for that? -Give you 25 quid for it. What? telling me not to get excited. Yeah, we don't like it, we don't like it. Neil's keen but what about expert Catherine? -I mean, it's quite rough. We'd like to pay about £10 for it. Sorry, I'm on your side! Yeah, £10. Way over the top! Because of the state it's in, yeah, I'm not going to argue with that. £10. Done. Thank you very much. A deal at £10 for the butcher's shop pig sign. I'll get there and she'll say, "I've got the ten lots." -OK, is it the whistle with the compass? How interesting. Girl Guide piece. OK, I get it. It's uncommon, it's quirky, but it's not substantial in quality. Do we know the price? Have you bought this? Not yet. But she likes it. And I guess she normally gets her way, don't you? I think people would go for that, if you could just lower it a tiny bit. -Really, really kind. Both of you. You look shell-shocked. Welcome to my world. Shell-shocked but three items purchased for a total of £50. and £10 for the Girl Guide whistle and compass. Takes me a bit of time to get in. -You could use the chimney pots. Do you not like those? I like them and I'm sure somebody else would like them. to buy those and have them in your back garden or something. You know, they'd be a pair. You have them priced here at £28 each. £20 the pair, you might say...? Go on, then. You've twisted my arm. Bit more decisive there. Neil's warming up nicely. -The sheer tactility of it. -How old is this, though? It's been made more recently. that we cleared and it's 200 years old. But we've got a pretty strong sense that it's not. You can't say that Neil's not giving this all proper thought. Well...if in doubt, leave it out. It seems as though they sell. One for later perhaps? A successful bit of shopping, though. and the pair of chimney pots for £20. And the trough is still under consideration. -Pretty nice place. Lots of nice stuff. en route to the town of Wakefield to find out all about another. and sculptors of the 20th century. international acclaim for her work. to find out more about the artist's extraordinary life. -This is some structure, is it not? Fantastic building. This is the Hepworth Wakefield. Welcome to Wakefield, and to Hepworth's birthplace. only a handful of internationally famous female artists. which now form part of the gallery's unique collection. She went to school in Wakefield. She went to Wakefield Girls High School. to go and pursue her studies at Leeds College of Art. But she went to Leeds and she met Henry Moore there. this real artistic inclination towards sculpture. together in London to study sculpture. taking trips to Paris together. resulted in the birth of triplets. around this time in Barbara's life had a profound effect on her work. One of the triplets, during the Second World War, was very ill.
She was treated by a surgeon called Norman Capener. as a sculptor and the work of the surgeons. continued for the rest of her life. What was she like as a person? What was her nature? I think she was very focused, very ambitious. and obviously working on commissions that were hugely important. I think she was a humanist at heart. She really believed in the kind of ideals of, say, the United Nations. and the kind of sense of a common purpose. outside the United Nations building in New York. diminutive Barbara Hepworth in her boiler suit and head scarf. Lovely to see this womanly figure against something enormous. Absolutely. It's quite inspirational, isn't it? Enormous belief in herself, which is great. and she leaves behind a truly amazing legacy. Wonderful. I hope she knows her work resonates everywhere. of Penistone, to J&B Antiques. Ooh, got a bit of class here. three sort of unusual, quirky, bit different. Do we want to carry on with the way we're going? Cos we're doing pretty well. The quirky thing's quite interesting, isn't it? I love the badger. Think he's amazing. How much is the badger? -That was the first thing I saw. -Budget gone on a badger, isn't it? Preserving animals, or taxidermy, goes back centuries. as a method of preserving newly-discovered species. But it's not everybody's cup of tea. Or badger, for that matter. I don't think I could bring myself to buy one of these, though. And it's a heck of a lot of money in one go. We haven't got that much left in the budget. I can't even touch it, actually. he's left on the shelf. Neil looks like he's got his eye on a bit of retro. -Do people collect tie clips? -Do you wear a tie clip? I don't... I haven't got a tie clip. It's more of a '70s, '80s thing, isn't it? It's ripe for coming back, then. You've got to be ahead of the curve. That's one way of putting it. But I'm not sure Catherine's on board. Men of England, are you with me? -The tie clip is coming back. -I'm not sure they are. Bygone era? It's antiques, it's all a bygone era by definition. and get as excited as you about two tie clips? I was thinking about buying this for myself, to be honest. -They'd make very nice hairclips. -Do you think? Is it me? you'll be cursing. Can I take that, please, for my own personal use? Come on, Neil, this isn't a personal shopping trip. the tie clips himself, rather than selling them at auction. -Ben, thank you very much for showing us your lovely wares. Lovely tie clips. Watch out for them. Get more of them. -Honestly, they're going to be big. I'm just off to put a tie on, actually. I might wear both of them at the same time. That could be it - multiple tie clips. adventurers have earned a well-deserved rest. So, night-night. and Neil has taken on the familiar role of chauffeur to Dame Diana. I feel like Toad driving his car going, "Whoop-whoop." Did you have a nice day yesterday? I had a lovely day. I absolutely adore it, it's my idea of heaven. Really nice having somebody like Paul there to explain stuff to you. Mind how you go there, Neil. I wonder if Paul agrees with Diana's version of yesterday's events? -I felt like a bit of a passenger yesterday. Look, Diana, you talk about getting in there, like a Terminator. and the girl guide whistle and compass for £10. Spending a total of 50, they still have £350 left. I was thinking about just buying this for myself, to be honest. I was totally amazed at how Neil was. -He really got into the whole thing. and antique markets for ever more. and the two square stone chimney pots for £20. They're also considering a pine salt trough. But that's on the back burner for now. Overall, they've spent £70, leaving them with £330 still to play with. in the town of Ossett, just outside Wakefield. which is also Diana and Paul's first shop. And our demanding Dame is keen to get shopping. Seems like she's found a practical use for that whistle. -Don't you get one of those. -That's not a bad idea, is it? Chop, chop, Paul. Best not keep her waiting. -Hello, lovely to meet you. I'm Diana. This is Paul. -Hello, Paul, lovely to meet you. You wish to discuss tactics. -which is going to make a zonking great profit. I'm good at the tidgies and you're good at the zonking. -Between us we've got the tidgies and zonking covered. and Paul's in charge of the zonking. That'll be a tidgy, then. Little golfer's hip flask and scorecard. I don't think it's an auctionable lot because of its youth. I don't know, it's not me. -It's not you but it's me. And they've generally got a budget. you know, lobbed it into the water. They might need a gulp of something! ignore your expert and carry on regardless. But is there a deal to be done? OK, I'll just speak to the lady who that belongs to and I'll be back. Well, it doesn't take Judith long to come back with an answer. Ah, yes, that was a purchase, Paul, despite your reluctance. At least it was only £4. of Otley and they're in a bullish mood. I think we've got it in the bag. We've already won. That Dame Diana Rigg knows a thing or two. and Paul was the chauffeur. -I've been there. It's s good role but you need to know your place. -And I think he knew his place yesterday. -Whereas, I think we were partners in crime. owned by husband and wife team Denise and Dave. -Well, Rummage. Are you ready for a rummage? Come on, then, let's go and have a rummage. Good morning. Catherine. Hello, hi. It's not long before Neil's making a beeline for an old favourite. -Oh, don't get him started. and concentrate on the competition. Or it could be... Is it...? No. Would it originally have been a printer's thing? Do printers use these and keep their letters in them? I'd say you might possibly be right. Catherine, my expert friend, are you busy? -Oh, I saw that outside. -You put your letters in here. This is for really big letters, obviously. -Have you got any thimbles? say it's a bespoke thimble collection. SHE LAUGHS Your tie clips will go in here. Yeah, but nobody wants thimbles now. What could you use it for now? Think about what we could use it for now. Tiny little shot glasses. Buttons. -Don't mind doing a deal. Can't pay the bills with stock. But would you mind a very low offer? -Ooh, what are we thinking of? To be perfectly honest with you, I'd offer £5. -I need to make a profit. And your offering me what I've paid. -No, I would have started at ten. -Hello! She's quick, isn't she? I think she likes that. -I seem to have made an offer. She's doubled her money. You did that without blinking. Looks like Neil's just getting started in here. The top people have one of these. There's an antiques expert hiding in there somewhere. I'll make you an offer for that little whatever-it-is boat. It's too small to be a gravy boat. -It's like a mint sauce boat. and a nice pourer. It's got a lovely shape. I'd like to slip you a fiver for it. For me, £5 would be a very good deal. There you are. Thank you very much. That's a lovely piece. -I'll get you some change. to add to his vintage printer's drawer for £10. and is trying to negotiate a deal on the salt trough they saw yesterday. Now, remind me again on the price? Do you think you'd do it for a cheeky 30? That would be really, really kind. Thank you very much. -30 - you got it for 30? You rang Carolyn and knocked her down? Well, no, she was more than happy. How many objects have we got? Six. Six lovely things for £115. I can't wait t see what they got. Come to Yorkshire, where your money goes further. -It's been great fun. Thank you. Bye-bye! Paul is still trying to keep up with his dame. It's the Anglo-Indian thing, isn't it? -I tell you what - to put me jewels in. -It's a tea chest we need. No, no, they'll fall out, but in the way it should happen. -I hear what you are saying. I think it's looking pretty. -I think another decision's been made, hasn't it, Diana? Shall I do the carrying? but Judith is off to see if a better deal can be agreed. Would £4 be all right for you? That would be perfect. Thank you so much! Diana's charm has done the trick. To get the trinket box for £4. Oh, that blasted whistle's back. Poor old, Paul. Diana, I feel like Pavlov's dog. Every time you blow the whistle, I sweat. Rather than salivate. -I saw that. I saw it. Tell me why you like it. You sell this to ME. I like it because of the wood. I like it because the hinges are of the period. -I like it because it's capacious. It's got a lovely honest, untouched patina. -And an elegantly simple object. But it is a proper antique! Remind me the price. Is it 120? I'm going to leave you to buy it. I've done most of the buying. -However, I've got a bigger task ahead of me than you. -Because I've got to get that down by 50%. Well, it's a big deal. Go, go, go. The pressure's on to prove yourself, Paul. but Paul's hoping to negotiate a deal for 60. Judith's back on that phone to see if the owner will do business. -Which is really kind of her. -We want you to succeed. I have got to shake your hand. And it's pleasure to shake yours. We have got to be happy now, Diana. That is a relief... and a very generous discount. leaving them with £282 still to play with. to one of Yorkshire's most architecturally stunning landmarks. of the 2014 Tour de France. The house was built by the Lascelles family in the 18th century. who made their fortune in West Indian plantations. by the very best craftsmen of the day. have amassed a stunning collection of treasures. -The Lascelles bought Harewood in 1730...? -There wasn't a house here, at all, then? They wanted the very best. and this was the one that they put all their focus in. the very best of everything of the day. And I think that tradition just continued. Harewood is just known for having the very best collections. The house was built under the supervision of Edwin Lascelles. Work started in 1759 taking 12 years to build. well into the 19th century. it was created to the highest standards. that adorn the walls of the house. which is a pretty impressive room. so this is the original scheme for this room. What was this room used for originally? -It was always a gallery. -To sit and admire your pictures? Well, yes. And the ladies could promenade. Or they could be entertained in here. So it was used for social gatherings. Don't say I don't take you to the best places. You do! You put on a good spread! with the finest artwork of the day. the Prince viewed him as a pretender! Hah! is reckoned very much like the Prince of Wales. The Prince is not pleased, at all. and he wasn't very impressed, at all. of the house and surrounding countryside. So there's a few small pieces here. "April 8, 1806, £63 to Mr Turner." One of the paintings he was paid for. and continued to come right the way through. and he was buying and acquiring pieces from a number of artists. So lovely to have. Just... Oh! or from THEIR original visit, and their friendship, as well. -I think that's really wonderful. Thank you very much. It's been lovely to meet you. -Thank you for having us here. Back on the open road with Diana and Paul. then the adorable Mr Dudgeon's. Don't say that, you'll jinx me! They're travelling to the village of Gomersal. but will anything catch their eye in the Old Silk Mill? You love dog... Do you love this dog? I'd say it's a setter, wouldn't you? Because of that fluffy tail. -Now, you know the name of what this is? Why? Because they made a lot of it in Tunbridge? Indeed. The body is actually rosewood. and it's a wee souvenir trinket box. And - at circa 1860 - it's 150-year-old. That's really amazing, isn't it? -And the work in that! Because that tiny pieces, aren't they? It brings in another field of interest into this lot. "Ah, costume schmostume... Who knows! ..but I like the box!" Don't know how much that is. Time to beckon owner - Tony. You're all right. She whistles at me! You got the polite "Tony, come-hither." Of course, we're going to ask! Look into the eyes. Not around the eyes, into the eyes. Diana and Paul walk away with the Tunbridge trinket box for £8. Gosh. to meet up with Neil and Catherine for the big reveal. he can take a swig of something. Isn't that divine? -A hip flask and score keeper. For a golfer. Have you ever seen that before? -I've led a very sheltered life. -I wouldn't say I played, no. -But have you ever seen that before? And you've got a whistle on the end. Yes, but you have you seen the glory of the whistle? And it's a Girl Guide whistle. Were you a Girl Guide yourself? No, I was a Brownie sixer. Time to examine Neil and Catherine's wares. It has the letters PRHA on the side. Pretty Hopeless and Risky Acquisition. I couldn't help it, gratuitous though it was. Oh, no - don't take any notice. Mm. What about the butcher's sign? Got to see it to believe it, frankly. We're very pleased with it. A very intriguing piece. Do you know, I'm gobsmacked. What is it? it's a pork butcher's shop sign. with an umbrella and a bowler hat smoking a cigar, clearly. I think it's a GCSE metalwork fail. Whose heart did that one quicken? -We both liked that, actually. where were you at when you got that? I mean, really! Nobody will make two of those, that's sure. What on earth will they say in private? Are you content? Do you think we're contenders? Well, I think the worst thing that we can do is be complacent. -So I think we go hoping. And let's do our best. We've bought interesting, quirky things that are a little bit out there. I'm really believing in my jewellery. -We stand by our objects, don't we? -I believe in everything we've done. -You're the pro, and you believe in it. Da-daa! for that local all-important auction. So, are our experts feeling confident? So, come on then, Paul... It's D-Day. It's Diana Day, that's what it is! Don't up the ante any more than it already is. -you weren't pleased, come on. -Well, seriously...! How much can I say? Sometimes it's best to say nothing, Paul. And auctions are unpredictable, so it's anyone's guess. her verdict on what our team's offerings are like. It's quite an interesting mix. Quite fun, quirky things. Also a few things that might struggle a bit, but we'll see how they'll do today. I think that's the best of the bunch, really. but we'll see how the day progresses. Both teams started with £400 each. organised into six auction lots. after spending £126 on this group of goodies. eyes forward and pay attention. The auction's about to begin. -I think it's looking positive. 10 to start me. Anyone tempted? £5 to start me. A sauce boat there for £5, anyone interested? No interest in that one. So we'll have to carry on. Neil liked it, but sadly no-one else did! Not the strongest start. -I didn't even see it. -I told you about it. -You've got to have it. but will it defy the doubters? I think it's a thing of beauty and wonder. if the good people have any taste and discernment. Ooh, I'm not sure you're meant to be bidding, I'm afraid. No? I'm afraid we're going to have to leave that one. Another one left on the shelf! But still time to pull in a profit. 0-0. Well, that even things up. Next, it's Neil and Catherine's pair of chimney pots. I'm bid £10 at the back, any interest at £12? £10, then, opening bid, any further interest? Surely that's £40, £50. Surely. I'm afraid not, Catherine. It's only £10, and a loss. Well, that's a swizz, isn't it? It's an outrage, Neil, it's an outrage. of the costume jewellery, trinket box and Tunbridge casket. -Every reason to be confident. 20 I'm bid, 22 standing. Well done! That's a profit anyway at least. Hurrah! A profit at last. and all those necklaces in the other box. It's nothing, though, is it, really? It's nothing. Neil's vintage printer's drawer is up next. Good way to display the collectables. £10 anywhere? £10 in the centre, any further interest? It could have been worse. I would take that. I would take that. After commission, that will be a small loss. I think somebody's got a bargain. Hopefully they'll do something interesting with it. Diana's Schuco clown toy is next. It was first thing she saw, and the first thing she bought. But how will it do? 22 and you're in the room. 22, 25, 28, commissions are out. Is that 30 there, lady's bid? -Going to wash its face. No, 38 then, still near the rostrum at 38. Another profit - and things are looking up. -That person's got a bargain. -So come on, Diana - you have done pretty well. -We are doing all right. Well, I'm not a greedy person, but I think it's worth more. -I think we should be happy. A profit is a profit, Dame Diana, and you're in the lead. Next up is Neil and Catherine's pig butcher's shop sign. Your pig is going to save the day. Yeah. The pig could save your bacon. -Right, here we go. This is it. Come on. The pig sign, then, at £30 with commission. 35 anywhere in the room? It's £30 then - any further interest? 35 there, 40. 45, sir. back with commission at 50. any further interest? Who has paid £50 for that pig?! With that great profit, Neil and Catherine are back in business. the Girl Guide whistle and compass. I want somebody to wet my whistle! £30 to start me, anywhere? 20 to start me? The Girl Guides whistle. God, they're not whistley people. -It's £10 in the centre, any further interest? For the opening bid of £10... And that's 207. -Well, it could have been. After commission, that will be a small loss unfortunately. Next - Neil and Catherine's backup buy, the salt trough. £18, near the rostrum. Any further interest? I'll sell... Oh, 20 there. 22. 25. Still on the rostrum, at £28, any further interest? And that goes to 609. -I thought you'd do well with that. -That was one of our best ones. when you take commission into account. But - it's all yet to play for. We've each got one lot to go, and you're £15 ahead of us. and most expensive lot is the 18th-century oak portable desk. It's £55 behind the counter. 55. 120, 130, 140... No? It's 130 on my left, seated. Selling for 130, any further interest? or Neil and Catherine are out of the game. £38, the lady's bid. Any interest at £40? It's 38 on my left, any further interest? -That's better than we thought. I think that was all right! That loss is the final nail in the coffin for Neil and Catherine. But it's been a fantastic contest. Well, I want to congratulate you two. -Good spot on the desk. Our celebrities started with £400 each. after auction fees they made a small loss, so they end up with £396.52. with £448.66, with all profits going to Children in Need. Well done. -Thank you for a marvellous experience. -In all the old familiar places. -You can drive this time. I've been driving for years. Give it a go. -Oh, all right, then, come here. Come on. I long to hear you crashing those gears for the last time! This edition of the celebrity antiques challenge sees Midsomer Murders star Neil Dudgeon take on Dame Diana Rigg in a quest for antiques glory as they travel around their native Yorkshire in classic cars with experts Catherine Southorn and Paul Laidlaw. While Neil finds his feet in the world of antiques, Dame Diana shows her expert that she is in charge right from the start.